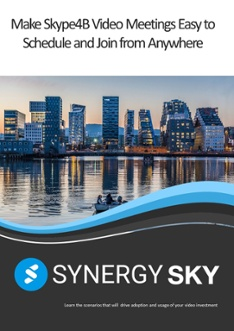 Their vision - to be a leading digital platform connecting jobs and people - require seamless video conferencing, and that’s where we fit in with our solution: Synergy JOIN. Monster are using Skype4B and videoconference systems from Polycom for internal and external meetings. Monster has a cloud strategy and recently moved Exchange from on-prem to O365. Their on-prem MCU / GW solution was swapped with Pexip Infinity cloud. We asked Lee Sullivan, Principal Systems Engineer at Monster, five questions as to why he chose Synergy JOIN and how it solved their challenges. 1. What challenges did you face before the deployment of Synergy JOIN? "When going cloud with O365 and Pexip, there was no logical or easy way to join Skype4B meetings from older Polycom systems. We needed a user-friendly way to schedule and join Skype4B meetings from video endpoints"
2. How did Synergy JOIN solve this challenge? "With Synergy JOIN we can let Polycom VSX and HDX join O365 meetings using Skype Online IVR. Just enter conference ID and you are connected. Now, users are just walking into the room, press the green button on the touchpad, and they're in"
3. How was the installation process? Did you need any assistance from support? We had a few service tickets, but they were all solved within an hour"
4. Has running Synergy JOIN been reliable, and what kind of maintenance have you done since the deployment? "We have done a couple of upgrades. But there hasn’t been a single technical problem!" 5. What have the feedback from users been? Did Synergy JOIN solve the video conference challenges you had in the organization? "No feedback – which means that things are working as they should. Synergy JOIN solved the video conference challenges we had 100%. If the users remember to invite the room, they can just walk in and join. We also have less support inquiries after migration to Pexip and Synergy SKY. All in all, we are very happy with this solution." Monster is a global recruitment platform, offering online employment services and solutions. With over 20 years experience, and 4,000 employees across more than 40 countries, Monster is a leader within the industry of online recruitment, and offer a broad spectre of services; searchable job advertisements; resume database access; recruitment media solutions through its advertising network and partnerships; social job distribution through Twitter and Facebook; display advertising; lead generation; social profile aggregation; and other career-related content. Monster operates as a subsidiary of Randstad,. Blog subscribers get email updates. Automagically. Experts in videoconferencing analytics, reporting, monitoring and scheduling. Supporting Microsoft Skype for Business, Cisco, Pexip, Polycom, StarLeaf, WebRTC and others. We love to talk videoconferencing - contact us!